English painter, who aspired to bring a new seriousness to British art through historical and religious work in the Grand Manner preached by Reynolds. His life was a story of bombastic frustration and intransigent opposition to the establishment (particularly the Royal Academy), fighting continuously for personal recognition and arguing for the social purpose of art. As a painter, however, his talents fell far short of his ambitions, his multi-figure compositions degenerating into turgid melodrama. His great monument, rather, is the massive collection of autobiographical writings he left behind him (various editions have been published), which gives fascinating insights into the contemporary artistic scene and paints a vividly detailed picture of his disturbed mind and tragicomical life. 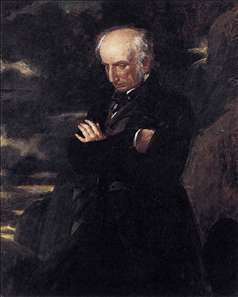 He was closely linked with the Romantic movement in literature, particularly with William Wordsworth, who wrote a sonnet to him, and with John Keats, doing portraits of both of them (National Portrait Gallery, London), and but for his lack of talent he would exemplify all the traits traditionally ascribed to the Romantic concept of genius. In true Romantic fashion his death came by suicide. 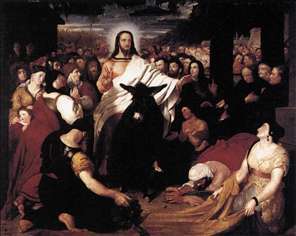 See more details about "Christ's Entry into Jerusalem"
See more details about "Wordsworth on Helvellyn"